The WH10V2 features the same circuit as the original with one major upgrade: a very sturdy metal housing. Ready now for the rigors of the road, the WH10V2 features the same multiple feedback opamp circuit as the original, a type rarely found in today's wah pedals. Tweakage is accomplished with a depth knob to control to level of the wah effect and a dry out for mixing a dry signal with the wah sound. The unique sonic character of the WH10V2 sets it apart from all other in its class. Someone know where we can buy enclosure for those wah DIY? Except BYOC, i don't know.. Brilliant, thanks for verifying Rolf! Will this one work with a 100k pot? Probably, but when the circuit was designed all the other components surrounding it would have been selected to get the best sweep out of the wah. That means you would undoubtedly have to also change other components to compensate for the pot change if you want it to sound as good, and as you can buy a 50K pot for $0.50, why give yourself a potential headache? With something like this I would always suggest using what has been specified unless you have the desire to tweak the whole circuit yourself. I went looking for a B50k Wah pot, and I ran into the WH10 dual gang 50k/500k pot on Smallbear. How would this hook up to this layout? Would you just leave the lugs for the 500k side unconnected? Hmm. I think that's for modding WH10 for wah/volume. Check the Bespeco Weeper wiring. I think I found my answer in the WH10 thread on FSB. The dual pot circuit is for the Grey version, while the single pot circuit is the Black version, though I'm not 100% on that. Fired up first go....and there was no good reason for it to, considering what I used haha. OPA2604 for IC. BC337 for NPNs and a random chinese PNP i salvaged from an old cd player. Its pinout was BCE so had to swap and insulate to fit the layout. Big smile on my face as it pretty much nails my original Black 1992 original. Looking forward to comparing it with the Parapedal...which is next. Is this schematic the same as the 1987's one? Build document, yes. Which is the same as WH10v2, except for the enclosure materal. 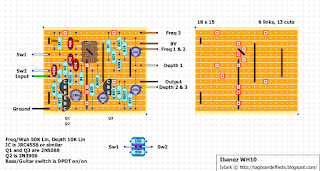 I posted a layout in the forum, I haven't built it yet to test however. Is needed put on board the two amp ops or not? I saw your layout picture and you're not using two amp ops as the squematic. 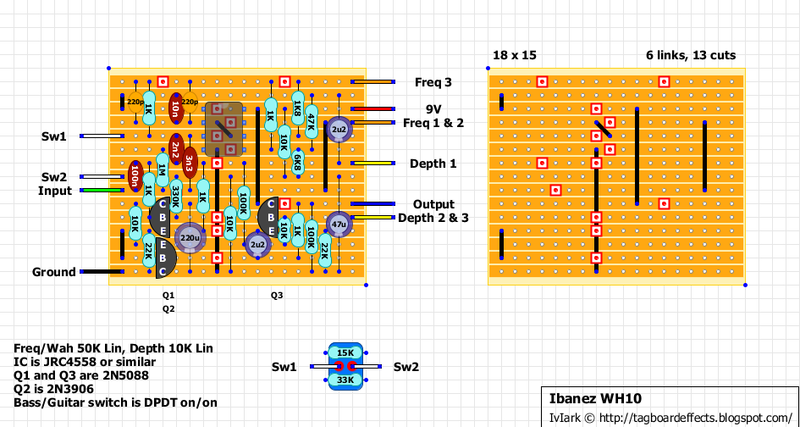 4558 is a dual opamp..the schematic uses exactly that one so it's verified and good to go as it is. I just built it, but it's not as "acid" as the original, and the bass setting doesn't work properly. What could be wrong? I used all the right components and double checked it plenty of times.. There just was an accidental solder bridge that made me suffer. Anyways, I was just attempting to put this inside an original WH10 case, but the standard linear 50k pot doesn't seems to work well. It can't catch the right sweep at all! I tried with the original pot replacement (which it's also 50k!) and it worked well, really well. Maybe it is just a little bit quieter than the original.